Located in the Galilee region, Migdal (Magdala) is the home of Mary Magdalene (Magdalene means "from Magdala"), one of Jesus' followers who was present at his crucifixion and resurrection. Magdala has quite an interesting story to tell. A few years ago, the land was simply a bare lot, purchased by a Catholic Father Juan Solana who intended to build a retreat center at the site. As construction began on the new "guest house" (small hotel) foundation in 2009, workers were shocked to discover a First Century Synagogue where Jesus taught. Even more incredible, archaeologists found The Magdala Stone in the synagogue. This slanted stone was used as a table for reading from the Torah or from scrolls. It's humbling to imagine that Jesus used this stone. The original stone is now in a Jerusalem museum, but the one at Magdala (below) is an exact replica. On it is one of the earliest known images of a menorah, which means the artist would have seen the seven-branched menorah in the Temple in Jerusalem. As archaeologists continued to dig at the site, an entire first century Jewish town was unearthed, including many homes and shops. Below is a mosaic tile floor in the synagogue. The next photo is a brightly-painted fresco wall, just outside the synagogue. The photo below is of a shop that features a pool where fresh fish were sold. Since Magdala is near the Sea of Galilee, just south of Ginosar, fish would have been a food staple. The next photo is a large stone storage vessel found at Magdala. The next two photos are of some of the homes at Magdala. The next two photos show steps down into a mikveh, a bath used for ritual purification. The photo below is the breathtaking boat-shaped altar in the church recently built next to the excavated Magdala. 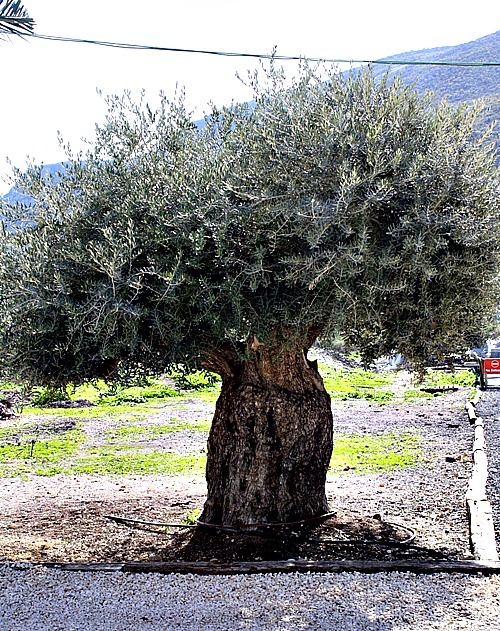 The last photo is a large olive tree at Magdala. You can read more about Magdala HERE. See more of my travels to Israel HERE. Wow, those are amazing pictures! It would have been humbling to be in a place as sacred as that. It was an amazing journey! Thanks for reading!